The Ugandan Speaker of Parliament, Rt. Hon. Dr. Rebecca Alitwala Kadaga laid the foundation stone as the chief guest during the ground breaking ceremony to mark the start of the construction of TWCH, looking on Martin Andrews of IFA (3rd left) and Ministry of Health Clinical Director Dr. Charles Olaro (4th left in white shirt). SOROTI – Approximately five-hundred people, including hospital staff, patients, building contractors and dignitaries from across Uganda and from Australia and the United States, gathered on March 2, 2018, to celebrate the beginning of phase one of construction on a state-of-the-art Women’s Community Hospital (TWCH) in Soroti, Uganda. The day of festivities included a range of speeches from important personages, a memorial tree planting, dance and drama numbers performed by members of Fistula Solidarity Groups, a luncheon, and the ceremonial signing of a “commitment banner” to ensure the ongoing dedication of all signatories. Attendees at the groundbreaking ceremony reaffirm their dedication to TWCH by signing a ceremonial commitment banner. Hundreds of thousands of shillings of donations gathered over the course of the day were more than matched by contributions from the honorable Minister of State for Disaster Preparedness Musa Ecweru, who directed that songs performed by fistula sufferers should be broadcast throughout the region to increase fistula awareness. “All women are the same no matter the size or color or education status. All deserve to be loved and supported,” said the lyrics of one song. Various speakers offered praise and hope for the construction of the new hospital. “To get this facility in our region is indeed a blessing,” said Director of Soroti Regional Referral Hospital Dr. Fred Kirya, who also doubles as a fistula consultant surgeon in Uganda. “It will decongest Soroti Regional Referral Hospital, improve material and child health services, reduce waiting time, improve patient care, and become a center for teaching and research in our region,” said Kirya, commonly known as Muzeei. TWCH will replicate the model of Dr. Catherine Hamlin’s Addis Ababa Fistula Hospital, founded almost fifty years ago. Ethiopia has recently begun to see a decline in fistula cases, though it is believed that undiscovered fistula sufferers in Ethiopia number in the tens of thousands. Uganda ranks third in the world with 200,000 existing fistula sufferers, and as many as 1,900 new cases registered annually. USAID/ENGENDER Health Country Program Manager Dr. Rose Mukisa put the future work of TWCH into context, noting recent research her organization and TERREWODE have conducted on an increase in the number of incurable fistula cases in Uganda. Mukisa urged hospital stakeholders to uphold the rights and health of women. “When you treat a woman, you treat a community and the country at large,” she said. Francis Engwau, the country representative of the United Nations Fund for Population Activities, said many women still lack access to quality sexual and reproductive health services, including lifesaving emergency for obstetric care, which results in maternal deaths and fistula. TERROWODE’s founder and Executive Director Alice Emasu Seruyange noted the importance of men and husbands in the fight to eliminate fistula. She stressed the need for fathers to provide a supportive environment for their daughters and empower them socially, mentally and economically as a preventive strategy against fistula. She said men are encouraged to participate, but not to lead in the over twenty-seven Fistula Solidarity Groups that TERROWODE has established across Uganda. “These groups are crucial to survivors’ recovery and empowerment of communities to prevent fistula,” she said. “Beside a strong woman, there is a supportive man,” Emasu said, adding that her husband Livingstone Seruyange and elder brother Stephen Emasu have been supportive of her efforts. She hailed the local government leaders from Teso for embracing the fistula program and expressed joy at the presence of women leaders including women members of Parliament at the event. “I urge all women leaders to guard this initiative, founded and led by fellow women, jealously. This initiative is no small achievement to women of Uganda. I am convinced that as women leaders you will continue to support efforts such as these to advance the plight of women,” Emasu added. Angelina Osege, the Soroti district woman Member of Parliament regretted that most women in Soroti have lost families because of fistula. Taking advantage of the event, Osege and the Soroti district chairperson, Gregory Michael Egunyu, asked the Government to address the lack of the hospital governance board, a refrigerator in the mortuary and an ambulance at the Soroti Regional Referral Hospital. The Guest of Honor of the groundbreaking ceremony was the Rt. Hon. Dr. Rebecca Alitwala Kadaga, speaker of the Ugandan Parliament, who arrived at 3:30 PM. Kadaga hailed TERREWODE for the initiative saying, “the hospital will not only serve women in Uganda. “This facility will be a centre for women in East Africa and not only Uganda because many of them currently cannot travel to Ethiopia for fistula services. Thank you TERREWODE,’’ Kadaga said. She urged the residents of Soroti to support the girl-child so that they can achieve greater opportunities and contribute towards the development of the country. She pledged support for the project and to see that two phases of construction are complete. The official launch of TWCH is scheduled for June or July of 2019, though services will have begun to be provided well before this date. 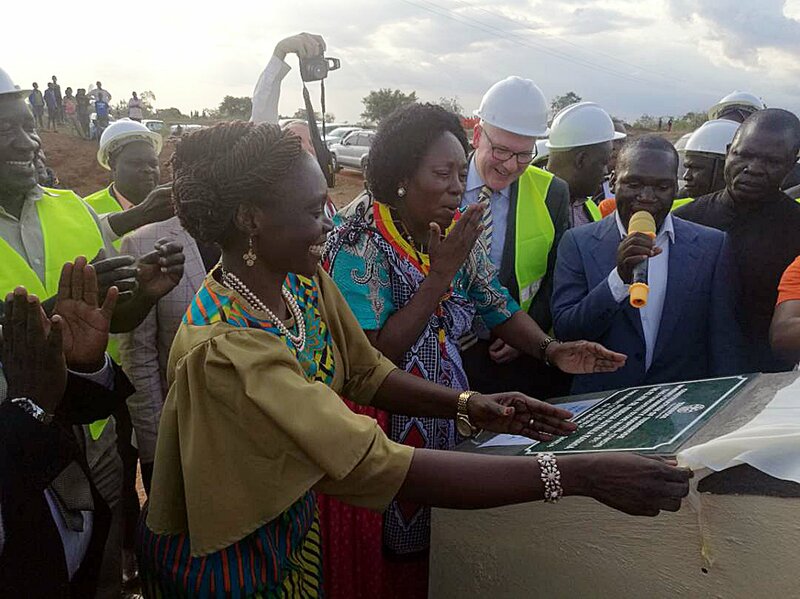 Kadaga, who has since 2013 been committed to support TERREWODE’s efforts against fistula, oversaw the unveiling of the hospital’s foundation stone, officially marking the beginning of construction and bringing the day’s festivities to a close.